If you’re following the TV series, don’t worry – Braavos will become a major player in the plot in the future. For now, you can happily ignore much of this, but be warned – there are spoilers (and lots of detail shots of the city) in what follows. Mapping cities takes time. There’s a lot of detail to be laid in. To help with that, I tend to have a TV series on in the background or an audiobook to listen to at the same time. For much of Lands of Ice and Fire I was listening to the incomparable Roy Dotrice narrating A Dance with Dragons. I’d make notes of any geographical reference as I went through, and it definitely got me in the right mind-set for the maps. But for Braavos I’d got through Dance, and I’d moved on to Netflix. In this case I picked up both seasons of Dollhouse whilst mapping this. Just as a book will always bring back the memory of where I was when I read it (Lord of the Rings – back of a Landrover in Botswana, His Dark Materials – at college looking out over rooftops), looking at this map brings back memories of Joss Whedon’s Doll House. Strange, and incongruous for the map, but true. 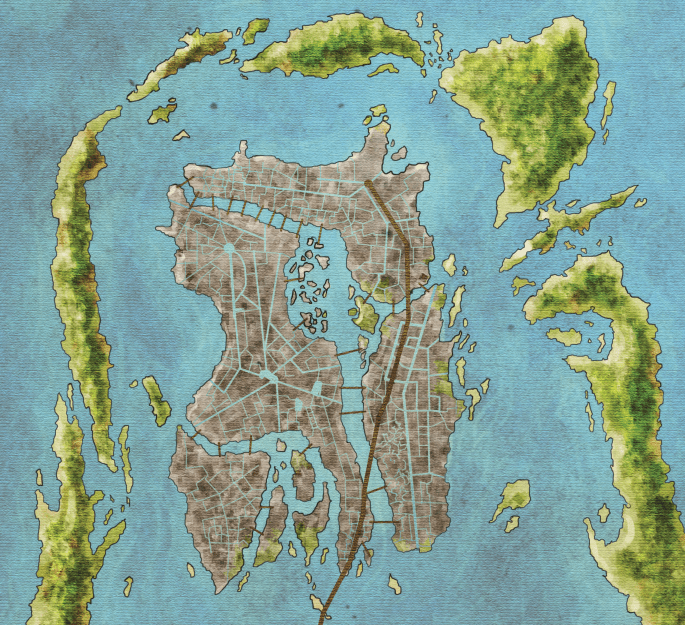 That should also give you some idea of how long this city map took to draw. The first step was to establish the overhead plan for the map. George had a very complete pencil map (as with all the maps), but because there had never been a published map this one was a little more fluid. I drew out an overhead plan view and located all the key places referencing the books. 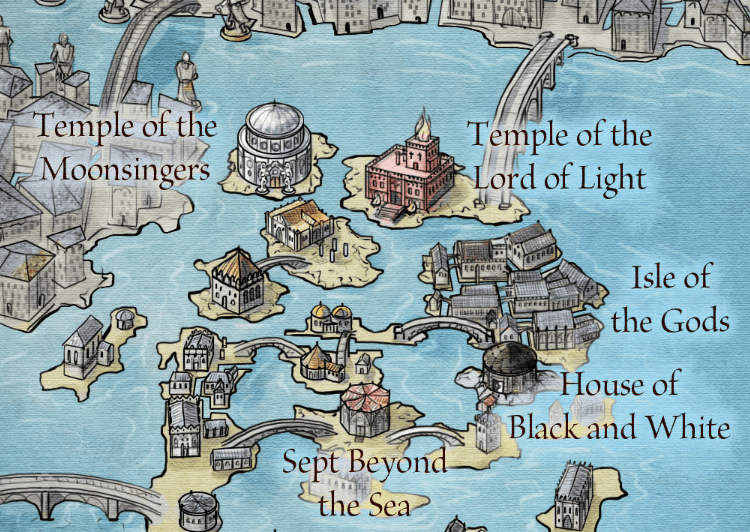 If you follow Arya’s chapters, you should be able to trace her routes precisely on this map – right down to the individual bridges she passes under. Once we had the overhead plan signed off, the plan was spun round and a perspective distort added. We agreed on an orientation (this map has north to the top) and I started working in all of the buildings and other elevations. Braavos is a very different city to King’s Landing. The available land is minimal, so the buildings are towering multi-storey edifices. Rather than roads the town is defined by canals and bridges. The city is short on timber – the forests on the surrounding islands are protected to help maintain a wind-break, so it’s a city of granite and slate. This is reflected in the colour-scheme and the building design. The city hosts a range of intriguing locations. Most prominent of course is the Titan – a vast structure standing astride the main watercourse into the lagoon. All ships must pass between it’s legs, and in the event of war, fire will rain down on invading ships (now that’s quite an image…). 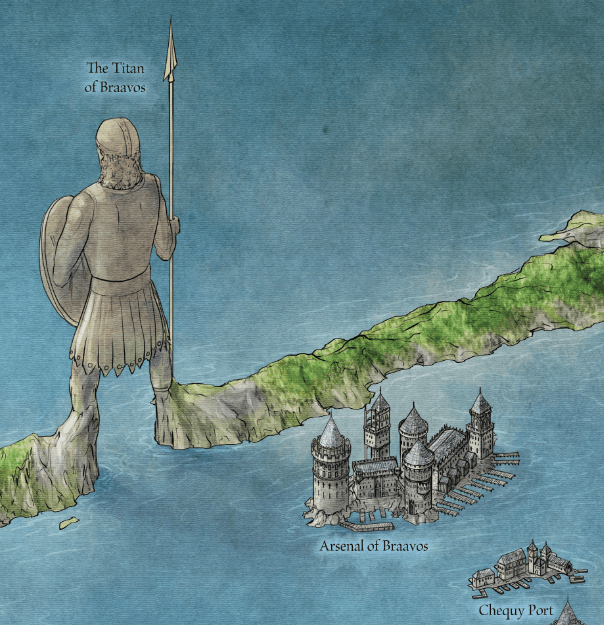 As we’re looking north, and so is the Titan, we see his back, with spear and shield, guarding the bay. We primarily experience the city through Arya’s eyes, following her journey past the Arsenal and the Chequy Port, into the city along the Canal of Heroes past 28 statues, and then through the islands of Temples, past the Temple of the Moonsingers, Temple of the Lord of Light, and of course the House of Black and White. The temples are as accurate as I could make them (right down to the colours of the House of Black and White’s door). The image above is around 300% the final print resolution. 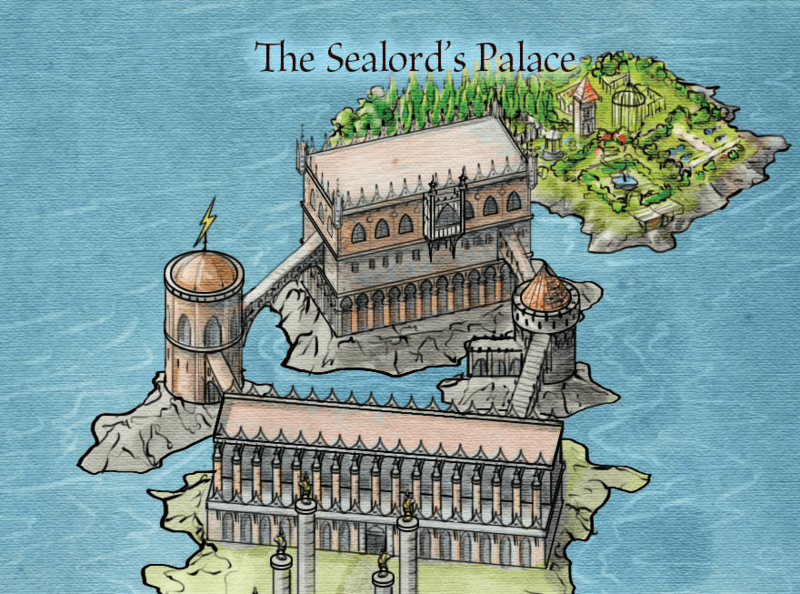 In the distance, we hear of the Palace of Truth, the Sealord’s Palace and the Moon Pool. We learn that Braavos is supplied with fresh water from a great aqueduct – the Sweetwater River – and that the lower elements of the city reside in Silty Town and the Fishmarket at the end of the Long Canal. But most of Arya’s time is spent by the Ragman’s Harbour in Pynto’s or the Happy Port, watching the mummers at the Mummers’ Ship or talking to the ladies at The House of Seven Lamps. Again, the bridges should all be in the right places and if you follow Arya’s wanderings you should be able to trace them through the watery highways of Braavos. 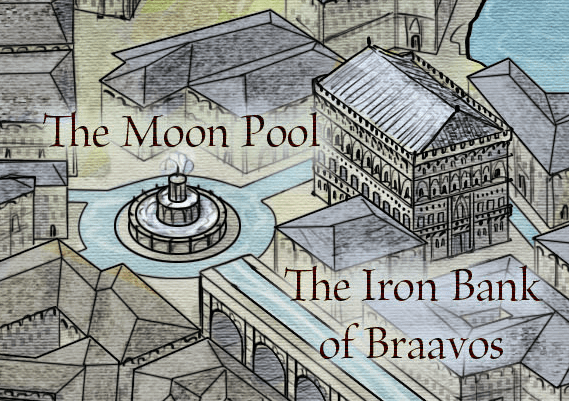 Braavos obviously has a heavy Venetian inspiration both in the cities construction and its architecture. Amongst the granite buildings there are grand palaces of the merchant princes that have made their trading fortunes, not to mention the powerful Iron Bank that can shape the fate of nations. This was a great map to create. 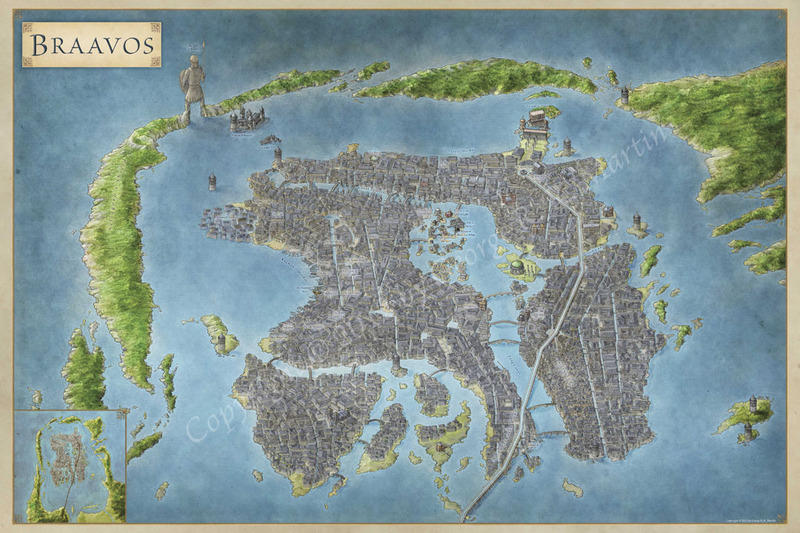 It was a thrill to detail the city and to get just a hint of what is to come (yes, look at this one carefully – there are locations on here that haven’t appeared in the books … yet). 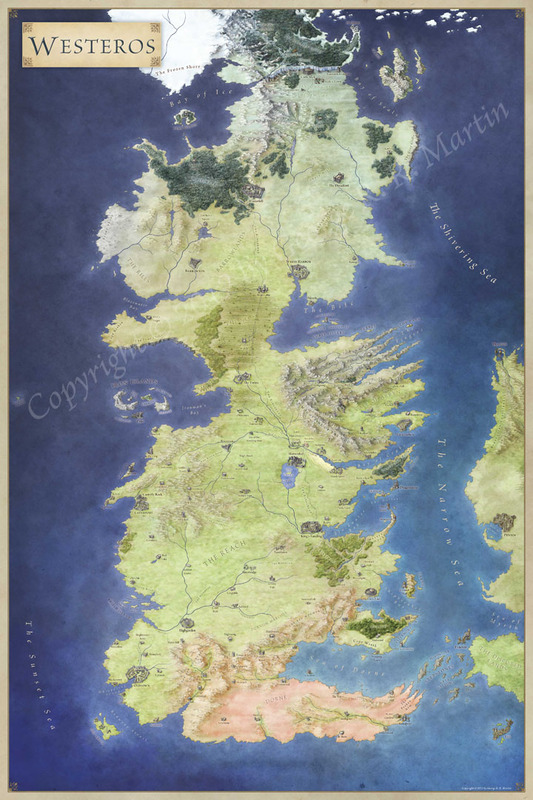 As with the other maps, you can pick up the full poster map as part of the Lands of Ice and Fire map folio. I’m blown away by these maps in general (I purchased two sets), but particularly this map of Braavos. Such an intriguing city; I’m happy to hear we will hear more of it in the next book(s). I wouldn’t complain if you were asked to create additional maps for places like White Harbor, Oldtown and Lannisport. But for now, I will keep poring over these. Thanks! I had a great time exploring the ins and outs of this city. As for other cities – I know that Meereen is high on the list of places people would like to visit. It would be great to see those pyramids properly mapped out, and to get a feel for the logistics of the battles around the cities of the slavers. It’s actually not. The architectural detail is intentionally inspired by Venetian architecture, but the palace itself is different. Dont the Titan of Braavos hold a broken sword? I hate to be a massive nitpicker, but in the books it claims that the left door of the House of Black & White is Weirwood and the right is Ebony and in this image it’s the other way around ;). Can I blame the fact checkers? 🙂 well spotted – you’re the first to notice that one. Your maps are always such a perfect blend of form and function – an evocative aesthetic of utility that I really wish I had any ability to replicate. Thanks! This one too a lot of work to get right. Turns out it’s tricky to lay out a city of canals as a 3/4 view map. Hi, I was wondering where I could purchase a print of this map? Yes of course! You can pick up the map here. Other than that great map! Absolutely fantastic! I love maps, so your website is like heaven to me! I have drawn up countless maps of my own fantasy worlds (one is 2mX1.5m and is too big to scan, if you have an ideas where I could get it scanned I’d be really grateful!) My Dad is a cartographer, so I have inherited his love and fascination for maps. Keep up the good work! I hope I didn’t come across too harsh, I really didn’t meant to be. I just got a bit annoyed when you said “it’s actually not” when it clearly was.